World Laboratory Animal Week is April 18 – 26th. Here are five ways to make a difference. 1. Attend a sit in on April 18th. April 18th, we’re organizing a sit in in front of the Harlow building. This will be a silent, peaceful protest. Important: We are not blocking people from entering the building or impeding foot traffic, just making our presence known. 2. Host a letter writing party. 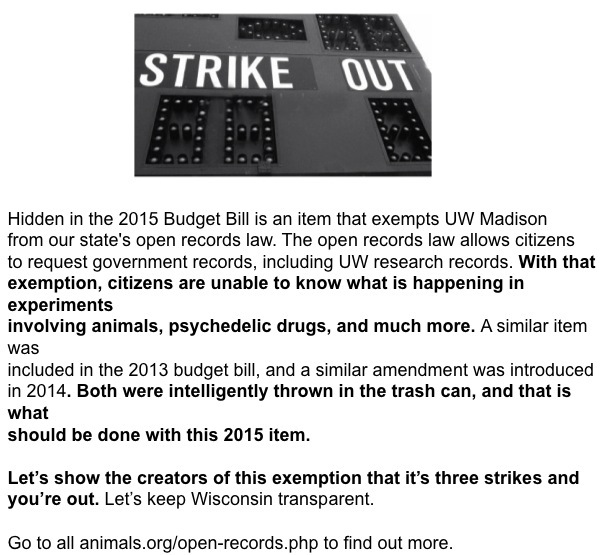 Our elected officials need to hear from us about the UW open records exemption, UW needs to hear from us about the Kalin experiments, and our local newspapers can use letters to the editor about lab animals in general. If leafleting and protesting aren’t your thing, host a letter writing party. We’ll give you samples of letters, and we can work with you to reserve a room at a library in your area. 3. Leaflet with us on April 25th, 11-1. April 25th, from 11-1, we’ll be leafleting downtown at the farmer’s market. Come join us! We’ll put more information on our website as the date draws closer. 4. Create an “ask me about monkeys in Madison” shirt or pin and wear it to a showing of Monkey Kingdom. Monkey Kingdom opens April 17th. This is an opportunity to connect with animal lovers, so please think about bringing some handouts, wearing an primate related shirt or pin, and/or speaking up for the Madison primates in any way you can. Send us pictures of your effort through alliance@allanimals.org, or tag Disneynature in your facebook posts or tweets. 5. Organize your own event during the week of April 18 – 26th and email alliance@allanimals.org with the details. I know you have a number of difficult decisions to make with this budget bill. This one, however, is easy. 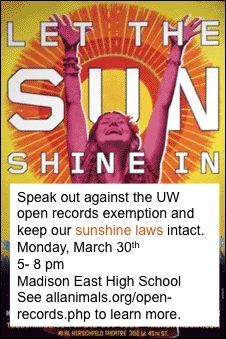 Please strike the UW open records exemption. It’s a policy item that has no place in a budget bill, and similar items were introduced and thrown out in both 2013 and 2014. Thank you for working so hard to make Wisconsin great. 1. Even the Arizona Governor veto’d this. 2. Please take a moment to sign and share this petition to keep UW Madison research open to the public. 24 states currently have closed university research records to the public in some form, pressured by the lobbying group National Association for Biomedical Research (NABR), a front group for the animal testing, animal breeding, pharmaceutical, and processed food industries. Tell the lobbyists they don’t own the government or university, we do. 4. UW Madison should not be exempt from open records requests. Throw the amendment to the 2015 budget bill in the trash with the 2013 and 2014 amendments. 5. We as tax payers have a right to know what our money is being spent on! There should be no exemptions when it is state dollars being used! If they are to be trusted at the UW research, why would this even be considered or needed!! Please remove this item from the 2015 Budget! Thank you! 6. Exemption from open records is in general a bad idea, but to grant a publicly funded state research University this privilege opens the door to all manner of abuse and questionable research protocols. As a former member of the campus-wide UW-Madison Human Subjects Committee I strongly oppose this exemption. 7. We, as a free nation, have the right to open records. The UW must not receive an exemption. Please make sure it does not get one. 8. More transparency is needed not less. The public has every right to know how their money is being spent and every citizen has a right to know what research is being conducted in our institutions. All government records need to be kept public. 10. We need to know what is being done to research animals. 11. Both taxpayers and animals should have rights in regard to experimentation at UW. 12. I’m signing this petition because we need to know what is happening when the university is doing research on animals. 13. UW researchers must be held to a high standard of accountability and transparency to limit or erase the cruelty they inflict on animals. 14. UW needs be transparent and accountable to the public for how it spends the public’s money. 15. No entity or person deserves an exemption. There are no checks and balances when an exemption is given. 16. it is only ethical that UW have open records for any and all reasons. 17. The state’s open record law is a citizen’s right to know what our government is doing, and we the people have a right to know what that is – no e entity, including the University of Wisconsin, has any right for an exemption to that law. Nor does this bill belong in the 2015 budget bill! 18. It is the right of the tax payers to know about the studies that are happening with our tax dollars and the UW should not be exempt from that. 19. Why such secrecy? If the research is on the up and up, they shouldn’t have to require their records be unavailable. They have been caught with their pants down too many times while in the process or doing this research,. This amendment is another “ends justifying the means” so the methods , however unscrupulous, can be ignored. We need transparency in all areas, including politics, and here is one amendment that the political motivations for agreeing to this bill is quite clear. 20. Animal abuse even in an educational facility must not be allowed to be hidden. Citizens deserve to know what their money is supporting. 21. I am in full support of the intent of this petition to keep transparency in business and other practices a priority. 23. As a UW alum, I firmly believe no single government agency as the right to conceal any information. If everything is on the “up and up,” why can’t that be shared? 24. As a Wisconsin taxpayer, I strongly oppose that the UW Madison be exempt from the state’s open records law. We need to know what is happening in experiments involving animals, psychedelic drugs and much more. 25. This is a state educational system and as such, should have open records. The citizens keep the UW open. I want to know just what goes on in the labs. I saw the “Harlow hell experimental monkeys”. Secrets are dangerous. 26. Because secrets in the public institutions are an open road for misuse, as is readily seen with the current crimes against animals being done by Kalin in his “research”. Why keep secrets when We are funding the institution? 27. I believe in accountability and transparency. 1. Go to a hearing. I went to one of the Budget Hearings Tonight and one of my reps (who knows me because I’ve talked with her a couple of times) said I was the first person who has brought up the UW exception from the Open Records law at the hearings so please please if you live in Wisconsin write the Joint Finance Folks and tell them you oppose that inclusion in the budget. If you choose to speak, here are two scripts and list of talking points you can use. Such an exception has nothing to do with finance, and such an action limits the transparency of the university to the tax paying public. As an animal lover and as someone who believes in the Wisconsin idea, this concerns me. Wisconsin deserves more from our public university and from our local government. If you cannot attend, see the next action item! Melissa Harris Perry calls voting the “brushing your teeth” of democracy, and when I told a friend that the other day, they said contacting your legislators is “flossing your teeth.” He said it’s something we know we should do more regularly, because it actually does make a difference. How you contact your legislators is up to you. You can email, write a letter, call, write letters to the editor, or all of the above! Don’t know who your legislators are? Click here to find out! N.B. If your legislators are on the Joint Finance Committee, it is CRUCIAL that you contact them. Click on the names below to see their contact information. 3. Sign up to attend Humane Lobby Day. Registration for Humane Lobby Day closes THIS THURSDAY, April 2nd. If you haven’t already, please sign up! Humane Lobby Day is a chance to talk with your representatives about animal issues that matter to you, and I have it on good authority that the UW open records exemption is going to be one of those issues. 4. Sign and share this change.org petition. 5. Use your creative side to create an image, gif, or video. Let’s make this message go viral! Email your image to hannah@allanimals.org and we’ll share it on facebook (anonymously or with credit, your choice.) Here are some examples! The text is taken from the first paragraph of the change.org petition and the information is from our page on open records. Click the images to make them larger. Optional #6: Mark your calendar for April 18 – 25! We are planning some great events for World Laboratory Animal Liberation Week, including a writers’ group event on April 18th and a public action on April 25th. If you have more ideas, please send them to hannah@allanimals.org. Thank you to the 15 people who attended the meeting last night, including Jeremy Beckham, who works at the Beagle Freedom Project, and whose full transcript and recording is below. Dr. Kalin is a primate researcher at UW Madison. He was at the center of public outrage a few months ago (although the Alliance has been following this for multiple years) because news came out about a maternal deprivation study he was planning to undertake with baby monkeys. The monkeys would be separated from their mothers, exposed to various stressors like humans and snakes, subjected to invasive tests (blood draws, skin biopsies), and then killed at between 1- 2 years of age. Their brains would be dissected, and the findings were supposed to help us understand anxiety in humans. You can read the original protocol here. This study, by taking baby monkeys away from their mothers at birth, subjecting them to numerous tests that will cause fear and anxiety, and, finally, killing them, is indisputably going to cause the monkeys a great deal of harm and a great deal of psychological suffering…And although I hope that this research, if it continues, will produce new information that will contribute to our helping the many people who suffer from anxiety or depression, I don’t think this extreme amount of suffering is ethically justified by that speculative hope. I have Dr. Streiffer’s full transcript, which I can share if requested. You can also watch his testimony here. So, just a couple of weeks ago, the medical researcher at the Wisconsin State Journal contacted me for a quote. 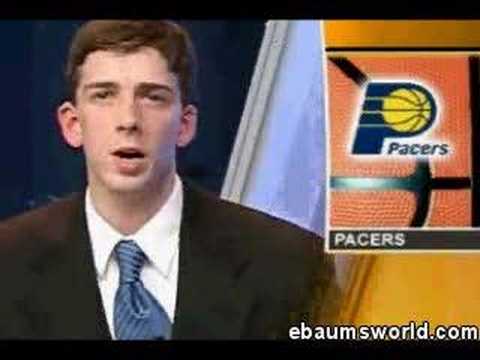 This guy. Image from WSJ site. There are a lot of bizarre things about this update, and I’ll cover some of them below, but the message to take away is that this experiment is still cruel and unjustified. 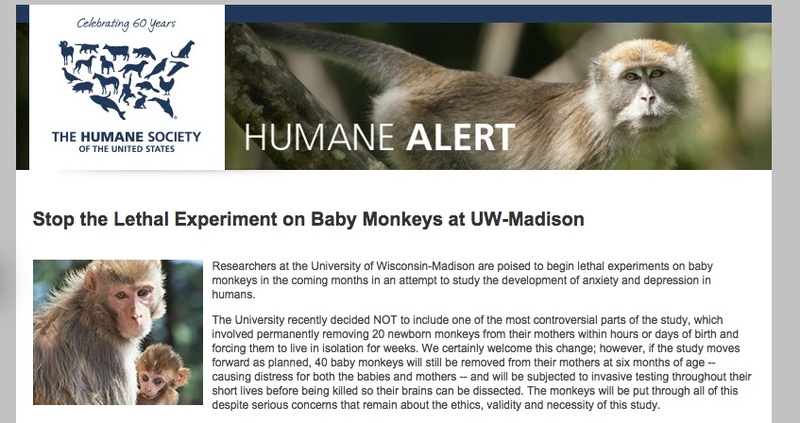 UW-Madison’s complete turnaround on monkey maternal deprivation experiments highlights the lack of ethical oversight on this issue. For months, UW faculty vociferously defended this research as being vital to the advancement of human health. But now, the lead investigator has suddenly decided that maternal deprivation studies are not necessary after all. It makes one wonder how many other useless experiments have been approved by UW’s animal research committee in the past, and how many will continue to be approved in the future. Their review process is clearly not working, and is in need of a major overhaul. Aaaaand boom goes the dynamite! As researchers and animal activists know, there is a lengthy, extensive process of review before experiments are okayed. This is the oversight that researchers always refer to when we say there needs to be more oversight. To change the experiment partway through is grossly inappropriate, and Dr. Sujatha Ramakrishna captures that exquisitely. Dr. Ned Kalin said he decided to keep the monkeys with their mothers in the weeks after birth because other research found removing them doesn’t increase anxiety as expected, not because of complaints by animal rights activists. While Kalin and his colleagues were developing a brain scanner coil to use in the new study, he decided to study another group of monkeys that had been neglected or abused by their mothers naturally and thus removed from them. That study involved 25 monkeys removed from their mothers and 25 monkeys not removed from their mothers. All of the monkeys were exposed to snakes and humans who didn’t make eye contact with them. The tests showed that the monkeys removed from their mothers were not more anxious. “We actually found less anxiety, to our surprise,” Kalin said. On one hand, Kalin couldn’t really say that he’s changing the experiment because the public is unhappy, because there is just a huge us vs. them thing happening between researchers and anyone who cares about animal welfare. Okay, that’s fine. But the finding that the monkeys removed from their mothers are less anxious and that’s why he’s changing the experiment? I just find that…surprising. Surprising and a little suspicious, as anyone who has been around children would. Whatever the reason, I am glad those poor monkeys will be suffering slightly less. But we need to keep in mind that these experiments are still institutionalized animal abuse. Researchers at the University of Wisconsin-Madison are poised to begin lethal experiments on baby monkeys in the coming months in an attempt to study the development of anxiety and depression in humans. The University recently decided NOT to include one of the most controversial parts of the study, which involved permanently removing 20 newborn monkeys from their mothers within hours or days of birth and forcing them to live in isolation for weeks. We certainly welcome this change; however, if the study moves forward as planned, 40 baby monkeys will still be removed from their mothers at six months of age — causing distress for both the babies and mothers — and will be subjected to invasive testing throughout their short lives before being killed so their brains can be dissected. The monkeys will be put through all of this despite serious concerns that remain about the ethics, validity and necessity of this study. Side note: If you practice meditation or mindfulness, but are unhappy with Dr. Davidson’s and Dr. Kalin, etc. experimenting on animals at UW and want to practice with a group that cares about animals, check out the Madison chapter of Dharma Voices for Animals. That’s the link to their facebook, or you can reach the organizer at dharmavoicesforanimals.madison@gmail.com. Wisconsin has an open records law that is part of a national series of laws called “sunshine laws.” The laws increase transparency. Wisconsin’s current law says that citizens can request records from government entities, including UW Madison research records. If you care about freedom of information, you need to speak out against this bill. If you care about animals, you need to speak out against this bill. There are a lot of reasons to be unhappy with the current budget bill, and if we don’t speak out against this item, it may slip by. My sense is that this is NOT an issue on lawmakers’ radar; that means it could very well pass with other proposals that are included in a sweeping package of changes affecting the UW. And once something becomes law, it’s really hard to reverse, as we were reminded later in the meeting by Jeremy’s mention of the UW animal cruelty exemption. We need people to organize leafleting, to table at the farmer’s market, to speak out against the bill, to plan and do fundraising for a potential primate research ethics conference, and more. Add your name here, or email me at hannah@allanimals.org. THIS MONDAY, there is a hearing at Madison East High School with Sen Erpenbach and Rep. Tayler, 5 – 8 pm. Please come if you can. If you live elsewhere, look here for other hearing dates (credit to AFSCME). From, of course, the 2009 production. Via wikipedia. Also, please look here (Joint Finance Members and Contact) to see if you have any of these representatives. If you do, contact them immediately. They are on the Joint Finance Committee and they have the most say in the budget bill’s final outcome. If you know people who live in their districts (see: Joint Finance Districts), contact them and ask them to do the same. Our friend Jeremy was nice enough to join us for the second half. Subsequent to his approval, I uploaded the mp3 file and transcript. I’ll include a summary, but I recommend reading the whole thing. – Jeremy has been working on 2 projects equally. The first is legislation to require labs to make efforts to re-home lab cats and dogs after experiments. The second is Identity Campaign, which lets people virtually adopt lab animals, give them names, and advocate for their eventual release. – There are three big beagle breeding companies, and one of them, as the Isthmus just pointed out, is in Mount Horeb. Between the three of them, they produce 12,000 – 15,000 beagles a year, and Ridglan in Mount Horeb produced about 4,000 last year. 95% of dogs used in labs are beagles because they are docile and don’t fight back when they’re being hurt. – We can’t do a lot at a legal level, since the legislation hasn’t been introduced in Wisconsin and we have an animal cruelty exemption for UW researchers as of 2011. We can raise awareness, though, and we are looking for your ideas. – To tie our two sections together, Jeremy talks about open records. Without open records law, adopters won’t be able to see what experiments their adopted lab animals went through. My name is Jeremy Beckham, and I used to live in Madison, several years ago, and I’ve just been working on the animal testing issue for many years, and now I work for an organization called Beagle Freedom Project. And Hannah had invited me to participate in your call, and I’m glad to be here! I’ll give an overview of some of the stuff I’ve been working on lately for Beagle Freedom Project. I would say my time and attention has been divided pretty equally between two things that we’re working on right now. The first is our legislation that we’ve kind of coined as the “Beagle Freedom Bill.” And, this is legislation we’ve already got passed in Minnesota, and it’s also pending in, I believe, five states right now. And what the legislation says is that after a dog or a cat has been used in an experiment, the laboratory must make efforts to find that animal a home. They would be legally required to. And the reason we’ve been pushing for this legislation is when the BFP was first founded about five years ago, at the beginning, we were able to get dogs and cats out of labs with ease. We would contact the laboratory, they were willing to give the animal to a home – please let them go when you’re done with the experiment. And we produced some videos based on these rescues, and a lot of the videos went viral. And by viral, I mean many millions of views. It’s possible some of you have seen them before. They’ve been shared a lot. They often say things like “Beagle touches grass for the first time outside of lab,” something like that. An example of one of the earlier, publicized rescues. Happy beagles! So after these videos went viral, and they showed clearly broken animals who had lived a life of deprivation in the lab, the research community started sending around these memos, saying “don’t let dogs and cats out of your labs any more: it’s hurting our image.” And then all of a sudden, no one was working with us any more. We weren’t getting our phone calls returned, we had to start playing sort of shell game where we would work with the local humane society or the local shelter and the laboratory would never know we got them. In fact, we’ve facilitated rescues of hundreds of animals that we’ve never even publicized, because we know if we publicize them, it’s going to jeopardize future releases now. So, we first approached Senator Scott Dibbl in Minnesota about this problem, and said we think that they [labs] should be legally required to release them. I mean, right now, they’re just killing them for no reason, other than to protect their image. And so it became law in Minnesota, and now this legislation is pending in CA, NY, NV, CT, and NJ. Right now the bills have been introduced, and some of them have already gone to their respective committees. And animal research communities are kind of freaking out about this. They’ve hired lobbyists in a lot of places, especially in California, because there are so many labs there, to try to fight this legislation. And remember, this legislation does nothing at all to interfere with the experiment itself. In fact, if the experimenter says killing the animal is necessary for the research, unfortunately we still can’t do anything about that. The legislation just says if a dog or cat survives an experiment, it has to be offered for adoption. It can’t just be killed summarily or as a matter of course. But the laboratories are very worried about what this is going to do if basically there are thousands of dogs and cats that are walking ambassadors against animal testing, because people will have them in their homes, they’ll be sharing their story with their friends and neighbors about why their dog is always afraid of metal – you know, that’s a common thing we’ve seen with a lot of our rescues; the animals have lived in cages their whole life, they have kind of PTSD symptoms with metal doors, you know, or anything that kind of reminds them of a laboratory life. If you live in New York, California, Connecticut, or Nevada, go to http://www.beaglefreedomproject.org/right_to_release to find out how you can support the bill. So, I’ve been doing a lot of research for that legislation in a lot of these different states, researching the various ways we’re using dogs and cats in experiments, researching what adoption policies exist in labs, if any, and working on our media relations, and some of that stuff as well, kind of putting together policy briefs and talking points, things like that, to try to make the case to legislators that this legislation’s important. The second thing I’ve been working on is a campaign we just launched – which you may already be familiar with a little bit – called Identity Campaign. And, I know some of you are familiar with, back in the day, when Primate Freedom Project was a little more active, when there were these things called Primate Freedom Tags. Where there were these stainless steel tags that actually had the information of the monkey who was in a lab. I know Bill Lueders bought one. So, we’re kind of taking that idea, that basic idea, applying it to dogs and cats, and then going a lot further with it. We have information for roughly a thousand dogs and cats that are currently in labs, and you can go on to our website and browse all these animals in these laboratories all over the country, including UW Madison…Identitycampaign.org is the website where you can go through. And you can choose one of the animals that’s available there and choose to do a virtual adoption for it, because, one of the reasons we wanted to do this too is that we have this huge waiting list for people who want to provide homes for a dog or cat who was used in an experiment and we don’t have enough animals to give them, because laboratories won’t work with us anymore, so we wanted to tell the people, why wait – you can do a virtual adoption now, and then advocate for their freedom and we’ll assist you in filing public records requests to find out what’s happening to your animal…and the idea is we wanted to give these dogs and cats an identity, so one of the first things you do, when you’re completing the checkout process after you’ve chosen your animal is we want you to give your animal a name. Right now, they only have a number, but you’re going to give the animal a name, and we’re going to use that name, because we don’t want to call a dog 0401. Now I know one of the reasons I was invited on the call, too, is about that Ridglan article, and part of my research was looking into the three biggest places that breed beagles for experiments. And, you guys might already be aware that beagles are the most frequent breed used- about 95% of dogs in laboratories are beagles – and perversely, the reason they’re chosen as a breed by animal experimenters is the very same qualities that make them wonderful companions – that is, they’re friendly, they’re docile, they’re very forgiving – those same qualities make them vulnerable to abuse, vulnerable to abuse in a laboratory. So, they make them easier to handle by technicians, they don’t fight back when they’re being hurt. So, as a result, there’s sort of a cottage industry that’s built up around specifically breeding beagles for experimentation. And the three biggest companies that do that are Covance – although not the Madison location – the Covance…in Pennsylvania. Covance does have facilities in Madison, but that’s not their beagle breeding farm. Marshall Farms, which is in upstate New York, and Ridglan, which is in Mount Horeb. And, between these three facilities, they breed between 12,000 – 15,000 dogs every single year, to sell for experiments. From ridglan.com, currently under construction. [Ridglan]…just last year, they bred under 4,000 dogs. I have the address – not in front of me – but if anyone wants it, I can’t share it with Hannah, and she can share it or whatever. Basically, the facility is a factory farm for dogs…Inside this facility is just rows and rows of cages of beagles, being bred for experiments, shipped all around the country. All around the country. And almost none of them come out alive. You know, most of these dogs are used in toxicity testing, so they’re being pumped full of chemicals and experimental drugs, and they keep increasing the dose in these experiments until they find that point where most of the dogs are dying or experiencing extreme symptoms. So, it’s a very tragic thing. Unfortunately, Wisconsin state law…now it actually has a complete exemption…as of 2011, the state legislature completely exempted researchers from crimes against animals. And that – most states now have that – where if you are an animal in a laboratory, there is no law – so there’s not much we can do on the beagle front, at least, you know, going after them under cruelty statutes, so we have a lot of work cut out for us. Thanks so much, Jeremy, and thank you to all of you who came, called in, and read this summary. Please feel free to share this information with others. I’m attaching two hand outs below about open records and Kalin, and some links to learn more about all the topics we discussed. Antivivisection Thursday: For the Monkeys and the Beagles Meeting TONIGHT! 1. Meet some like minded people! 2. Snacks! You can’t have snacks over the phone! 3. First 15 people get a COMMEMORATIVE BOOKMARK! 4. Lots of literature, AND collaborative brainstorming sheets! If you can’t come, I hope you call in! Mark your calendar for a March 26th, 7 – 8 pm, combined Anti-Vivisection and Companion Animals Meeting at the Lakeview Library. 7:00 – 7:35 will be focused on Kalin, and 7:35 – 8:00 will be a town hall forum to discuss Ridglan and what actions we can take. A representative from the Beagle Freedom Project will be available via conference call, and you’re invited to join us the same way if you can’t join us in person. WASHINGTON—The Institute of Medicine today released a report that finds that chimpanzee experiments are not needed to develop an HIV vaccine, hepatitis C antiviral drugs, or treatments for a wide range of other human illnesses. The report underscores the need to end chimpanzee experimentation in the United States, the last nation on earth still conducting large-scale experiments on humankind’s closest genetic relatives. Experts from the nonprofit Physicians Committee for Responsible Medicine (PCRM) testified before the IOM during the seven-month report process, providing evidence on the scientific and ethical problems of chimpanzee use in invasive experiments. PCRM | Institute of Medicine Report Could Spell End of Chimpanzee Experiments. Read about the Great Ape Protection and Cost Savings Act here. “New groundbreaking experiment simultaneously demonstrates that rats have the capacity for empathy and humans do not.” Well said. Calling someone a “rat” is no compliment, but a new study shows that rats actually are empathetic and will altruistically lend a helping paw to a cage mate who is stuck in a trap. Not only will rats frantically work to free their trapped cage mate; they will do so even when there’s a tempting little pile of chocolate chips nearby, the study reveals. 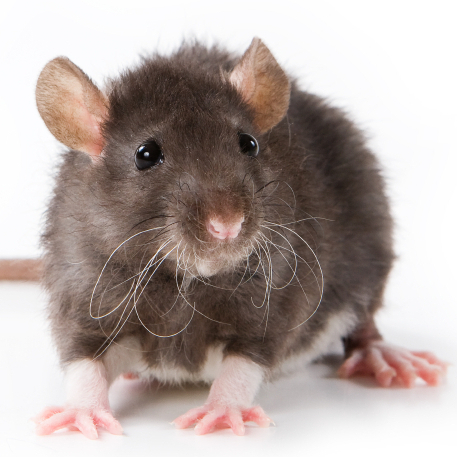 Instead of leaving their pal in the trap and selfishly gobbling the candy all by themselves, rats will free their cage mate and share the chocolate. Cagebreak! Rats Will Work To Free A Trapped Pal : NPR.